A Paradise in GTA V.
You may be looking for Paradise FM. The Bravado Paradise is a vehicle in Grand Theft Auto V, introduced in the Beach Bum Update. It is a camper variant of the Rumpo. 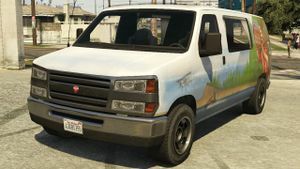 The van is available with four different paintjobs: "Surf", "Shark", "Logger", and "Octopus". "Logger" paintjob (Rear quarter view). This page was last modified on 6 May 2014, at 19:52.